It’s time to take a look at a racing game that I’ve had on the back burner for quite a while. Ridge Racer always looked like a lot of fun and to already have 7 games it must be quite successful. As soon as I put the game in I was impressed because the graphics are out of this world. It might not be a stretch to say that this is the best looking racing game that I’ve played although F-Zero is naturally up there as well. It’s a really fun racing game although I think it could have done a better job of explaining the confusing layout of the menu and advanced mechanics. The main mode here is naturally the Grand Prix. When you step inside a bot gives you your current stats. This happens every time you enter the mode which may be excessive but I do like the fact that the game keeps track of everything. That even includes play time which is nice as I now know that I played this game for about 4 hours. That’s a pretty reasonable amount of time considering that a lot of big games tend to be that length nowadays like Sonic Forces and Black Clover. Of course there is a lot more to do here that will take you over 4 hours. There are 14 Grand Prixs to deal with. Aside from that you also have a bunch of corporate companies who will challenge you to single races and exhibitions. Clear them all to get your completion % to 100%. Aside from this mode you also have the shop, event mode, and some kind of super event mode. I usually cover replay value at the end, but since I’m talking about content already I may as well address that. This is the kind of racing game that you can play for a very long time. It also has online support to back it up and local multiplayer. Think of any kind of content that a racing game would typically provide and this game has you covered. It’s really quite impressive when you think about it. Now, whether you will have enough driving skills to tackle all of that content is another thing. That brings me to the cars aspect. I was only able to clear the first 5 GPs in this time frame because of how this part works. So, you have cars for various categories 1-4 and you use them to clear the events. You start with 1 car for each category and gradually work on obtaining more. The problem is that the ways in which you unlock cars are rather vague. Is it from the corporate sponsorships or should I be doing a different mode for that? The layouts aren’t very user friendly so if you want to find the right car you’ll have to cycle through a bunch of them. All of the cars can also have upgrades and modifications done to them but you can’t see how the stats change for the car. I guess you gotta find that out the hard way? It’s little things like this that will make you wonder if it couldn’t have been done a little better. Personally I found it to be a little hard to understand. Perhaps there is a better way of upgrading your car but I couldn’t find one. Then everything is also super expensive. Buying 2 cars and 2 packs of boost were enough to make my character bankrupt. I guess I would need to keep replaying the old events to get more money or something, but that seems like it would take a lot of time. Towards the second half of the game the cars just got way too fast and my little car just couldn’t keep up. I prefer when the cars don’t change speeds like in F-Zero or Mario Kart. Have the tracks get harder and the A.I. more intricate but don’t mess with the cars. That just seems like an unfair advantage to me. Also, the game quickly started to re-use tracks which I found to be a bit dubious. I think the grand prixs should not reuse tracks unless it’s the final one or an “All Star” cup of sorts. Otherwise the game is just attempting to pad out the time. As mentioned the graphics are extremely good. The cars look very lifelike and the tracks are polished to perfection. Whether you’re playing a daylight stage or driving through the night the levels are very well made. There’s one level where you drive next to a waterfall which was a lot of fun. I also enjoyed the soundtrack. It’s a little limited compared to other racing games but the tracks are very fast paced and filled with energy. It really allows you to cut loose and jump into the fray. We also can’t forget the actual gameplay of course. This game is all about drifting which makes it a little different from the average car game. There are a lot of turns and the only way to get through them is to drift. To properly drift you have to stop accelerating by either braking or simply letting go of the ignition. Once your car starts to turn then you have to gun it once more to correct your path. It takes practice for sure, but after a few levels you will likely be able to handle it. You’ll need to be self taught though as the game isn’t too helpful in this regard. Beyond the boosting it is a pretty straight forward racing game that isn’t too out there. I’ve always been a big fan of the racing genre so it was definitely a lot of fun. This genre is one that can get old if played for too long though so I do recommend taking a few breaks. Don’t try to clear everything in one shot. Overall, Ridge Racer 7 was quite good. It lives up to its reputation and I was certainly satisfied with the game. I’m not sure if I’ll be getting any other installments in the near future but if I do it would certainly be the Gamecube spinoff. After all, that one actually has a story mode which is really impressive for a racing game. I don’t think I need to tell you readers that this is quite rare. Need For Speed is really the only big racing series I can think of that has consistent plots at this point. If you like racing games then I definitely recommend picking up Ridge Racer. It’s a very by the books title that polished all of the technicals to a T. Its only failing is that the game can be a little too ambitious without letting you know what is going on so prepare to learn everything on your own. 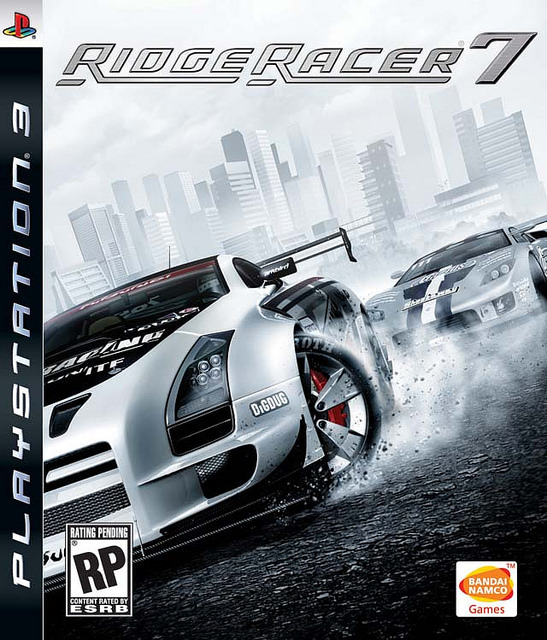 This entry was posted in 7 Star Games, Game Reviews, Games, Reviews and tagged Driving, Franchise, Futuristic, Game Review, Playstation, PS3, Racing, Review, Ridge Racer, Ridge Racer 7, Sony, Video Game Review by dreager1. Bookmark the permalink.